I know I have seen some plans out there for one, but now I am having trouble finding it. Anyone got a link for plans that they can send me to? FYI... I am not looking to make something super accurate. And with some further digging... I found one of my old posts on the topic!!! Cool. Think I am good, so please ignore! What size or type of sine plate are you looking for? 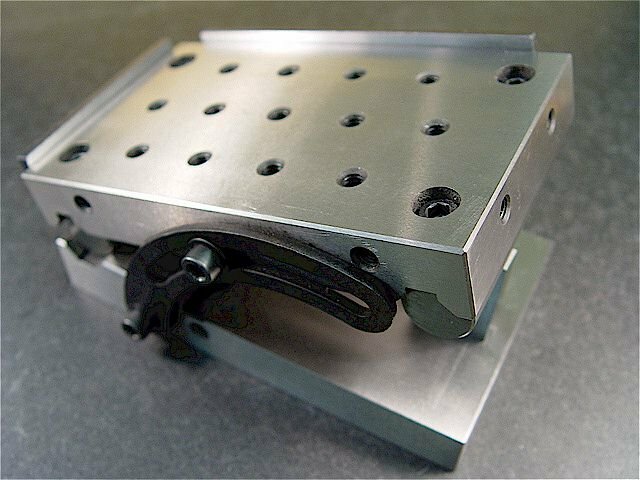 I have several designs ranging from ones I did for the (American) National Bureau of Standards to quick & dirty adjustable angle plates for milling machines. But what size? 5 inch centers, 10 inch center, something else? 12 inch X 8 inch, 6 inch X 20 inch, 6 inch X 4 inch, ??? It does make a difference. Well, I have to fit it on my mill table and it is a mini mill. 4x2 would also fit my little Taig mill. Quick and dirty, eh? How about a piece of aluminum plate bolted to a piece of 2" round aluminum bar? Can be held in the vice on your mill, and set at any angle with a protractor. The table was set into the bar so I could rotate it 90 deg. I was still working on it when I took the pics, so surface is a bit rough. I was experimenting with flycutters. I have since smoothed the table and drilled a pattern of holes for clamp screws. I don't use it every day, but it works when I need it. Now that is a good quick and dirty way of doing it. That will work for me. So, looking at it, does it have to be round bar? I would think that square stock could work? Well, if you only wanted 0 deg and 90 deg... You have the mill table and a standard angle plate to accomplish those positions. What about 30, 45, or 60? Or anywhere in between? The round bar has a step milled in it equal to the thickness of the plate and aligned with the center axis. You set the round bar in your vice and the plate rotates like a hinge. Tighten the vise at the angle you want... Capish? Maybe the pictures I posted are confusing. The one of the tool in the vise was the setup I was using to flycut the plate. I posted that picture to show the inset of the plate into the round stock. It could be used in that orientation, but the true 'angle plate' use would be with the round stock held 90 deg to that shown. HTH! That's what it is. I understand now. Thanks for clarifying. What amount of downward force do you think these can hold up to? I'm thinking of making something similar for my drill press. The plate might be 4-5" square, but needs to be really THIN since I don't want to take up too much of the miniscule 8" of throw I have. You are bound to have "It depends..." type answer. From my bad memory 10-12 mm dia drill needs something like 200 kg force to feed it into structural steel, without pilot hole. Your variables are material, drill, pilot hole and most importantly feed and how heavy handed you are. My personal experience is that drilling needs a good support from below. Maybe you can use something light to make a setup and good clamps and jack screws to hold piece up.